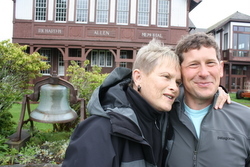 An Alabama woman who spends her summers in Sitka wrote a check to the Sitka Fine Arts Camp for a half-million dollars. Carol Odess made the donation in support of Allen Memorial Hall, on the Sheldon Jackson campus. The building holds a dance studio, number of rehearsal rooms and an auditorium. The building will keep its name, but the theater inside will be named in honor of Odess and her late husband, Jack. Carol Odess lives most of the year in Alabama, but today she does not look like a woman from the South. She wears Xtratuf boots and rain pants, and sometimes can be found on the lawn of the Sheldon Jackson campus, practicing her fly-fishing cast. She and her husband, Jack, have written big checks for the arts before. The black-box theater at the University of Alabama at Birmingham is named after them. They were friends with the university’s president, who pestered them to help finish off the school’s performing arts center. “And so she kept on and on and on, and finally Jack said ‘Oh, we might as well do this, because she’s not ever going to go away,’ because we were all good friends anyway,” she said. Dr. John Odess was an ear nose and throat surgeon who retired from the University of Alabama in 1981. He started the nation’s first clinic for people with cleft palates, and helped create national safety standards to prevent hearing loss on the job. They found Sitka through a fishing trip to Baranof Warm Springs the last year John Odess was alive. After his death in 2003, Carol Odess started spending more time here. “And I came and stayed a month, the next time I stayed six weeks, and then I stayed seven weeks, and then I stayed five months, and now I stay four months,” she said. During that time, she often took walks past the campus. So, when Alaska Arts Southeast, which runs the Fine Arts Camp, took over the campus in early 2011, Carol Odess called the organization’s executive director, Roger Schmidt. The more she learned, the more excited she became about the possibility of having another Odess theater, this one in Sitka. She even showed up to do some work. But she also says her donation was about more than having a theater bearing the Odess name. It was about supporting Sitka, a place she’s grown to love over the last 10 years. Odess says the money she contributed is NOT intended to replace the volunteer efforts that have gone into Allen Hall. Instead, it’s to help those volunteers get the materials and support they need to continue their work. And she says Allen Hall – and the Odess Theater inside it – will fit into its own niche in Sitka. Schmidt, from Alaska Arts Southeast, says the $500,000 from the Odess family will help with big needs. That includes adding heat and other work that will allow year-round use. As Odess and Schmidt talk about the building, they sit on folding chairs in the middle of the cold auditorium. The walls are half up, with exposed studs and insulation. The stage is dark, and framed in plywood. But when Odess lets her mind wander a little bit, she sees what it could become.